NFC is a wireless communication technology that allows two devices to talk by tapping them together. NFC is meant to be simple, quick and intuitive. No pairings and no elaborate setups required. NFC interaction requires nothing more than a simple tap. Due to the short communication range, it is not easy to have unwanted reading or tracking making it one of the appealing factor of NFC. With NFC, you can tap your mobile devices to your everyday objects and certain pre-defined actions will be performed like exchanging digital contents, interacting with your social networks, changing your device settings or even open an application on your device. With its simplicity, NFC is touted to be the technology that bind the physical and the digital world. As of today, more and more NFC-enabled devices are being rolled-out by manufacturers which include mobile phones, tablets, gaming consoles and laptops. NFC Forum is an industry association that promotes the usage of NFC. 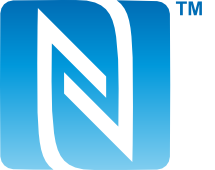 They introduced the N-Mark symbol above to indicate NFC availability for a product or service. In NFC reader-writer mode, two components are required; a reader and a tag. Tap the two of them together and magic happens! The good thing about NFC tag is that it is passive. That means, no battery or power source is required. NFC tags draw power from the device that reads them through magnetic induction. When an NFC device (e.g. your mobile phone) is near enough, it energizes the NFC tag and communication will take place. What is NFC tag chip? 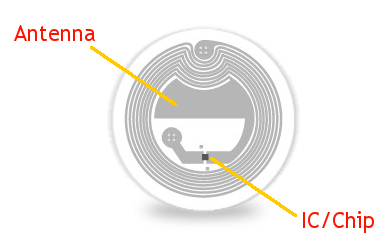 An NFC chip or IC is the brain of an NFC tag. There are various type of NFC chips in the market. They differ mainly on memory size, memory layout configuration, security features, price and other extra features. We list in the table below, the types of NFC chip that we stock in order to help you to choose the one that suits your needs. Highlights Cost effective. Great for short URL. Great for general purpose tag. Good scan distance. Great for general purpose tag. Good scan distance. New generation chip. Large memory. Good for contact data (vCard). New generation chip. Highlights Enough capacity for contact data. Limited availability. Legacy chip but still widely used in the wild. Large memory but limited compatibility. Large memory. High price. Encryption capability with special application. Large memory. High price. Encryption capability with special application. NFC Forum Tag Type (Type 1,2,3,4 tag) specification was introduced to ensure interoperability between different NFC tags and devices, providing a consistent user experience. These are just some examples of what NFC can do for you. The possibilities are only limited by your imagination!